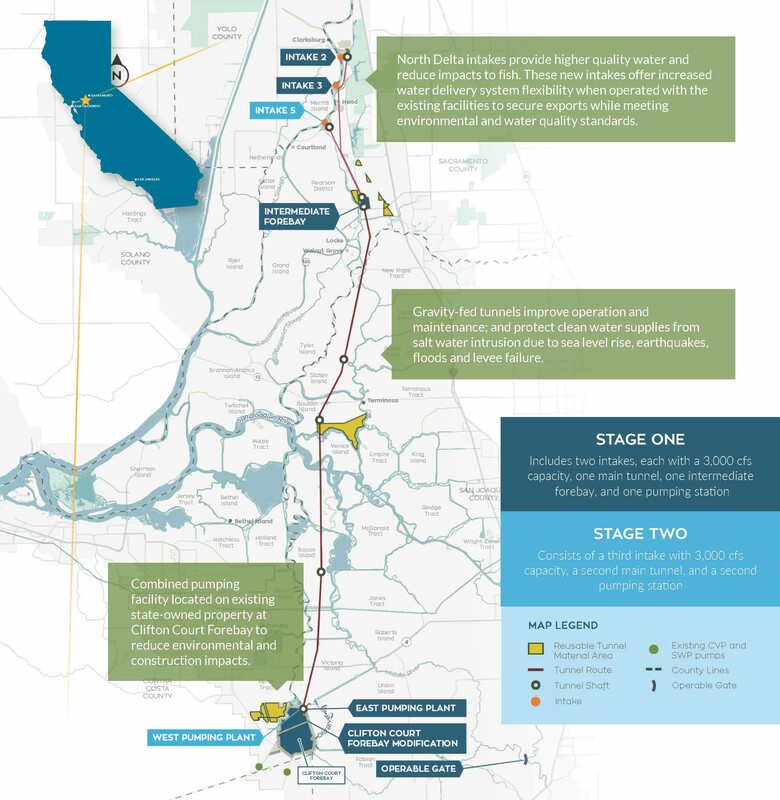 California WaterFix Delta bypass twin tunnels route map. From californiawaterfix.com. A press release issued Tuesday explaining their action, it stated, the board of directors of the Metropolitan Water District of Southern California voted today to provide the additional financing necessary to allow for the construction of the full California WaterFix project. In October 2017, Metropolitan’s board initially voted to participate in WaterFix and contribute up to 26 percent of its $17 billion cost, or about $4.3 billion. But the majority of federal agricultural contractors who also import supplies via the Delta have yet to commit to investing in the project, leaving part of the project’s costs unfunded. In February, the state proposed building the project in stages instead–starting with two intakes and one tunnel, with a capacity of 6,000 cubic feet per second. An additional intake and tunnel would be added when funding allowed. The Metropolitan Water District of Southern California is a state-established cooperative of 26 cities and water agencies serving nearly 19 million people in six counties. The district imports water from the Colorado River and Northern California to supplement local supplies, and helps its members to develop increased water conservation, recycling, storage and other resource-management programs. This entry was posted on Wednesday, April 11th, 2018 at 7:56 pm and is filed under News, Delta & Environment, Water. You can follow any responses to this entry through the RSS 2.0 feed. You can leave a response, or trackback from your own site.